Just one week following the Pangbourne Hasler we were off to Henley for another race. Once again, we were lucky with the weather, just enough sunshine to top up the tan but it was a little windy on the Henley straight giving some challenging conditions. I felt that I was paddling at sea some of the time and in Division five K1 and with twenty-seven boats on the start line wash was horrendous. Henley is yet another beautiful stretch of The Thames for a race and Henley Canoe Club organised an excellent event. Our thanks to all at Henley for this. In 3K1 Simon TC paddled a gruelling 12 miles to get a good division three race under his belt. Well done Si! Stuart Q elected to paddle in 4K1 (he could have done 5K1) coming 4th scoring 19 points. This is only his second race after a gap of many years so a good result. Greg W, also paddling for the first time after a long break, flew round the course in 5K1 coming third, gaining another 19 points and promotion to division four. Gavin L and Steve M came 14th and 18th respectively in 5K1. I had a poor start but an exciting finish sprinting to the line and holding off a FOX paddler by only one second. In 9K1 Chris R coped well with the windy conditions to come in 10th. Well done Chris. In the doubles races Peter W paddling 5K2 with his daughter Eleanor (ex-Pangbourne, now with the RAF) had an exciting race with four boats coming into the finish neck and neck: they finished 4th only one second behind 3rd place. Fay B and Caroline W came 11th in 5K2, both glad to be in a stable boat. Robin T and Tommy F shot off the start line like the star ship Enterprise leading 4K2 up to the portage but eventually being pushed into 4th place. Well raced against strong competition. Conor M paddling 3K2 with a Reading partner had a comfortable win coming in more than a minute ahead of the second crew, a large margin at this level, so a good race there. Once again, our juniors did us proud with Jensen M coming 2nd in U12Males and Amy G 1st in U12females. More significant for Amy was that she was 6th out of all the junior competitors after only a handful of races, so well done to both of our juniors. The next Hasler Race is Banbury on Sunday 28th October. It would be good to get out a strong team to see if we can get into this years’ Hasler Final. The Sun Shines on Pangbourne! Sunday 9th September – a date to be remembered for members of Adventure Dolphin: we held our annual Hasler race based at The Centre. In recent years the race was based at Home Farm but this year it returned to the Centre. First, a big Thank You to all the helpers both on and off the water, without whom the event could not have taken place. The races were marshalled very efficiently which made the “on the water” side run smoothly and everything from car parking to catering went well “on the land”. With over 300 competitors it was a big undertaking and its success was a real endorsement for the charity. There was a wonderful atmosphere and Georgie kept everyone entertained with her commentary and eclectic musical taste. This was the first race in the 2018-19 series and for the first time there was an extra race – division ten, an Open race (i.e. in any craft) of 4 miles for under twelve paddlers who want to race a longer course than the Lightnings. Races are held over 4 miles (divisions 7-10), 8miles (divisions 4 to 6) and 12 miles (divisions 1-3). In division 9 singles Nick A came sixth and was promoted to division eight and Daisy was our top junior performer coming tenth out of 30 in a strong field where the top seven paddlers were promoted. Chris R and Hazel B also paddled well, Ruth S did her first ever K1 race and Mike H his first ever race. In division eight Ian P paddled hard to gain fifth place just 17 seconds short of promotion. In division five singles Gavin L came in the top half and Stuart Q, racing for the first time in many years gained a podium place (third), proving that paddling is like riding a bicycle – you don’t forget. In division three singles – a twelve-mile race – Conor M managed eleventh and Jarvis M fourth. These are good results considering the quality of the competition. In the doubles races Peter W and James B were second in division eight C2 resulting in promotion to division seven despite hitting a tree at the island. In division five Fay B & Caroline W and Steve M & Paul A came tenth and eighth respectively with close times, similarly in division four Tommy F & Robin T were eighth pipped by Owen B & Mark W in seventh place. In the Junior race Jensen M was second in K1 and first in K2; Amy G was third in K1 and third in K2. She was buzzing as she got off the water from the K2 race as she only entered at the last minute and was not expecting such a good result. The Hasler season runs from 1st September to 31st August each year. In the 2017-18 season Pangbourne Canoe Club were 7th with 36 points. Only the first five clubs qualify for the Hasler finals, so we didn’t make it. Realistically, we need to increase number of paddlers to qualify. In the Geoff Sanders Trophy competition for Lightnings we scored 73 points with a team of only two: the winners, Leighton Buzzard, scored 570 points with a team of eleven. Again, simply by increasing numbers we can gain more points. Club points after the first race (Pangbourne Hasler) in the 2018-19 season put Pangbourne Canoe Club in 6th place – can we go one better and get into the Hasler finals this year? The next Hasler race is Henley on 16th September then Banbury on 28th October. After this there are some longer races including the Ross Warland Memorial Relay Canal Challenge, Basingstoke Charles Hicks Canal Challenge and the Frank Luzmore Memorial Race all around 12 to 20 miles taking us into the winter season. Then it’s the Watersides, Thamesides and Devizes to Westminster Race. If you would like to try your hand at racing, please email one of the race coaches and we can arrange a time for you to have a go. Allier 2018; from wings to white water! Although not my first time to this amazing, beautiful and stunning river, it very much felt like it. As many of you know, I regularly train hard with the marathon group, preferring to race competitively, instead of throwing myself down crazy rapids; and with GCSE results day looming, going on this year’s French trip seemed like a bit of a ludicrous decision………how wrongly I interpreted the situation. From start to finish, I can honestly say that this year’s trip was firmly the best French trip in recent years. After setting up camp on a (thankfully!) dry day, we rested in hope of regaining some energy lost from a long exhausting drive down to Langeac. On the Sunday, a nice gentle warm up paddle from Langeac to Lavoute Chilac to get back into the flow of things (excuse the pun). On the Monday, after having loosened up, we tackled the Parades to Langeac; having to face the mighty weir flume – a personal highlight of the section, with some potential laughs as a few swims occur here. Then on the Tuesday a very, very early start (a tough life getting up at 7:30am) was well worth it for the gorgeous paddle from Chapeauroux to Alleyras – otherwise known as ‘that section with 40 rapids’ – with a few technical bits to keep us on our toes. Although a great paddle, we returned to a half- swamped campsite which may have been a good paddle in itself, but morale was bought up by a quick change to pizza and chips for tea (a wise move by the trip leaders some would argue). Then came Wednesday……. the grade 3 section (dun…dun…dunnnnnnn). Not only was I paddling this section to prove others I could still ‘probably paddle’, but I wanted to show myself that I was still capable of paddling a technical section of white water. The doubts disappeared quickly as I tackled the section with relative ease, possibly better than I did a couple of years ago (ask the coaches as I believe I’m rather biased, who would have thought?) reassuring me why it’s my favourite section of the river. Thanks to the dynamic duo of Liam and Boothy for taking me down this section, without which I wouldn’t have realised I can still paddle on moving water. Thursday. Day off for some. Results for others. Anyone on the trip would be able tell you how fear consumed me the night before, anxious about not being at home to open them. Again, my worries were unnecessary as I passed all my subjects, and gleefully celebrated with a drink on the house from the local bar- a regular evening spot for some on the trip. Then Friday came, the final day of paddling and the penultimate day in France. The dynamic pairing of Gillespie/Fitzgerald teamed up again (open canoe this time!!) to brave the Parades to Langeac section – no problem for Janet obviously as there were no portages for things to go wrong (I’m sorry Janet, I just had to). 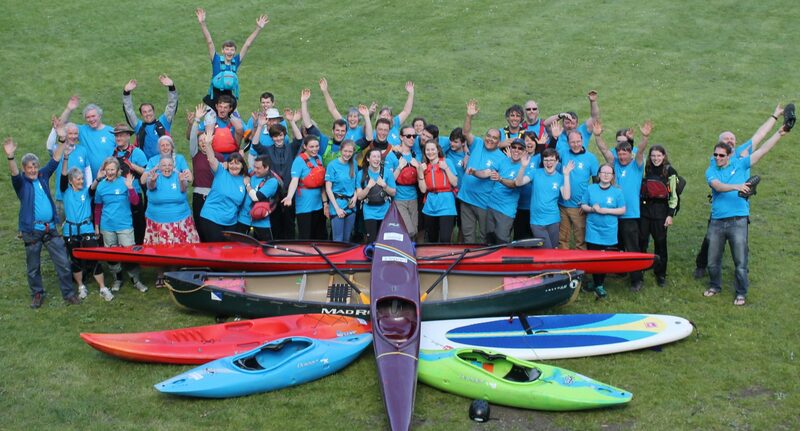 Open canoeing was different and very much interesting on white water – an experience I have Ian Flanders to thank for, and would definitely recommend to those who haven’t endeavoured before- challenging me in new ways as an already confident paddler. Saturday was interesting to say the least. The group started with an early morning high rope session beside the river (so we can technically claim that it was still a river trip). I would like to thank the Frenchman who ran the high rope course for putting up with laughing Brits during their briefing for the sole reason that the briefing was in French. Camp was quickly dissembled and we were on our way……to Ikea, for MEATBALLS! A long drive was ahead of us, and being in the trailing bus, was very confused when the leading bus (being driven by none other than Mr Dave Booth) detoured into the centre of Paris. A quick photo in front of the Eiffel tower for the Instagram (tommy.fitzy, hit me up) as well as negotiations with a French salesman for a laser (he started at €25 and we ended up at £12, so the real question here is, Why am I not in Brussels negotiating our Brexit deal? Overall it was a fantastic week away with many laughs – but not so many rolls- made even more enjoyable by the company in which I was surrounded for the week. I would personally like to thank Dave, Liam, Paul, Ian, Corinna (Fizzy to some), Janet & Jack for collectively help run the trip, without who the trip may never have ran. And finally I’d like to thank my Dad (Tony to the rest of you) for working tremendously hard to make this year’s trip possible- whilst committing to his role as treasurer as well as his full time job (plus having children to take care of)- which was enjoyed by all those who were there. 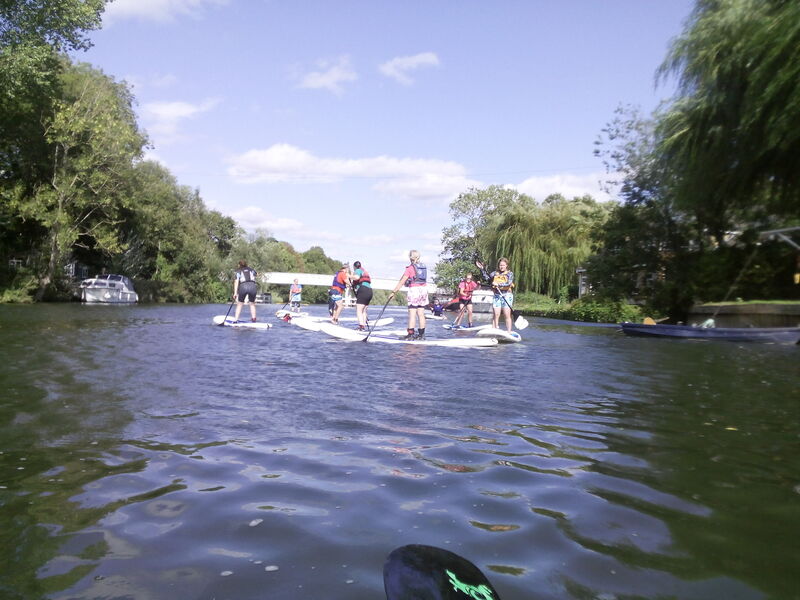 Jack Hulse, one of the Paddlesport Team Leaders said: “We are keen to create new opportunities for our younger members to come together and try something new. The sessions will be split into two groups, and following Adventure Dolphin tradition, they have been named “The Penguins” for our 11-14 year olds and “The Dolphins” for those aged 15-18 years. The sessions will run fortnightly on Sunday mornings. Sign-in is from 9.30am, to be on the water for 10am, with a 12noon finish. 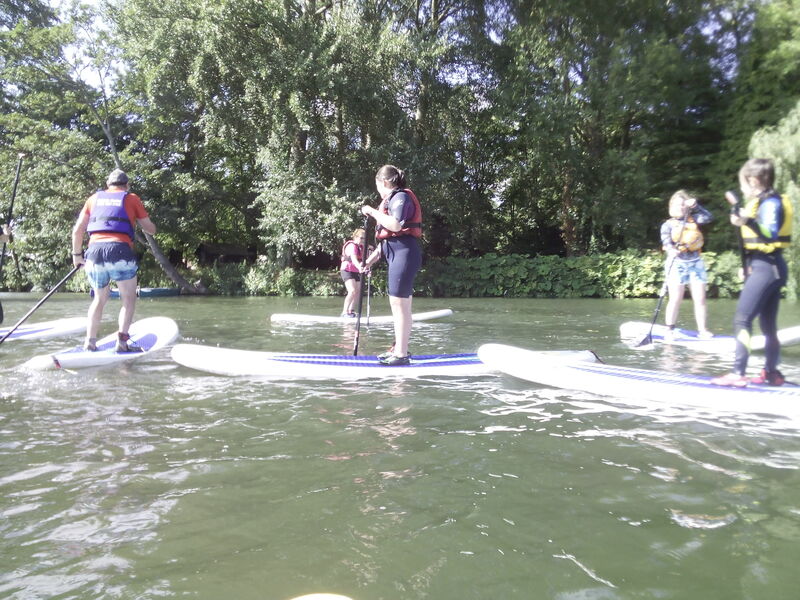 Don’t forget, the Sunday morning paddle is on at the same time, so Paddlesport members could leave their adults (1 star holders +) with Nick, Chris and Don for a paddle too! To enter the Spooktacular event, you must be a Paddlesport member (or an associated family member). So, don’t forget to put the date in the diary and further details will follow nearer the time. It was a warm Sunday afternoon. The ducks quacked and the swans preened. 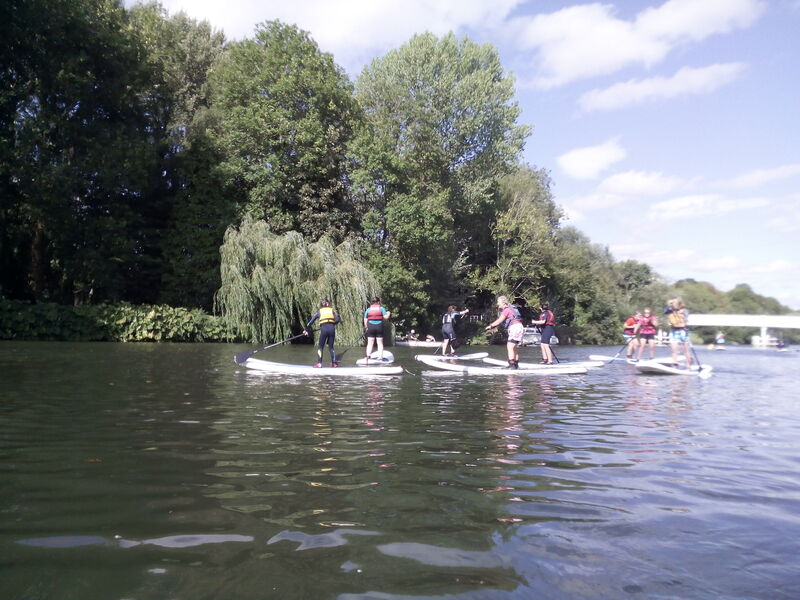 The sun was out and 13 people turned up to our inaugural Stand Up Paddle Boarding sessions. We had a fully booked session. We had both families and individuals participate. We toured around the Mill Pond, Lock Cut and went up to the islands. We covered how to paddle stroke, reverse paddle turn, and the tricky step back turn. All participants did very well. 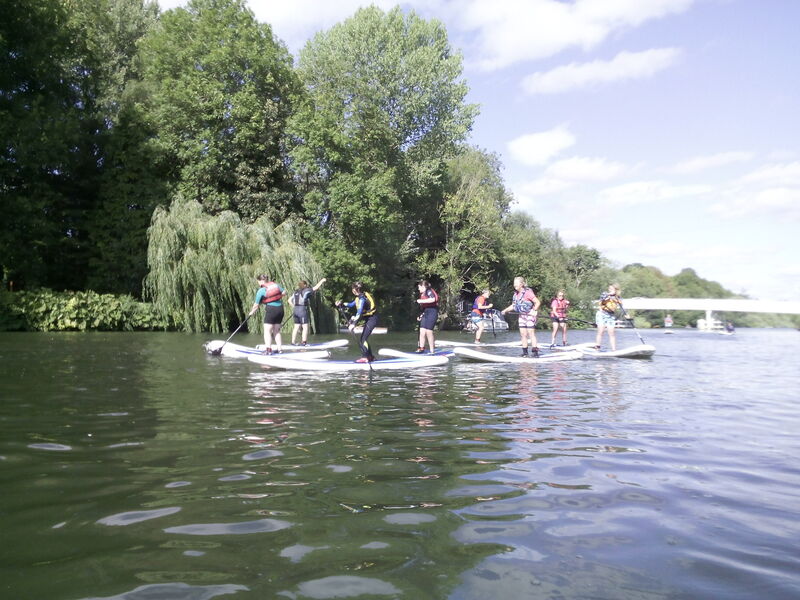 We had a 100% success rate where everyone stood up on their paddle board; and this includes some who previously had not been able to do that. 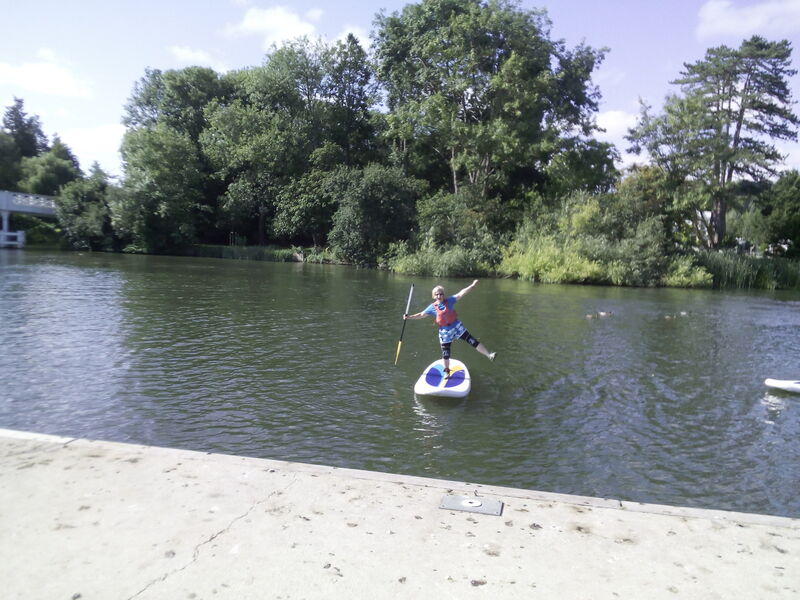 We had a great day paddling amongst the ducks and the swans. 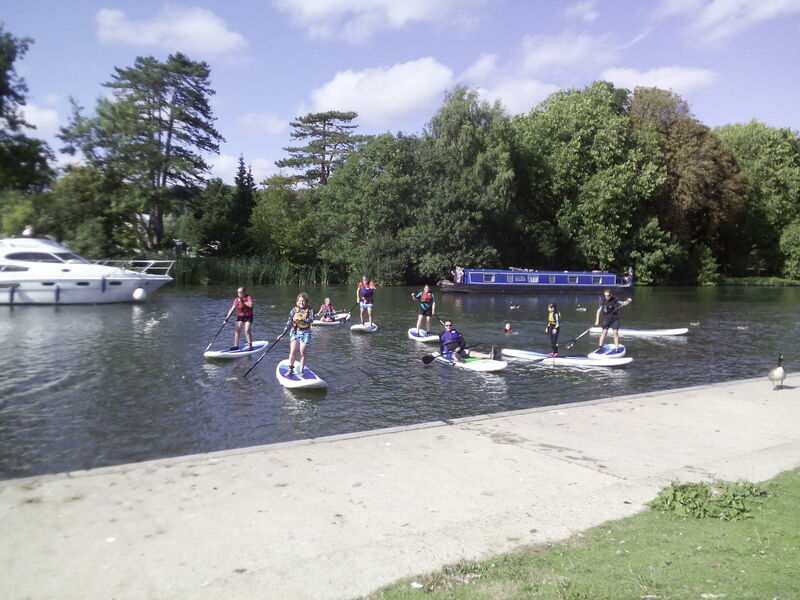 Thanks to The Outdoor Academy for the SUP loan and to Claire and Penny for their support. We are set to hold another session on 30th September. Visit our online calendar for further information. 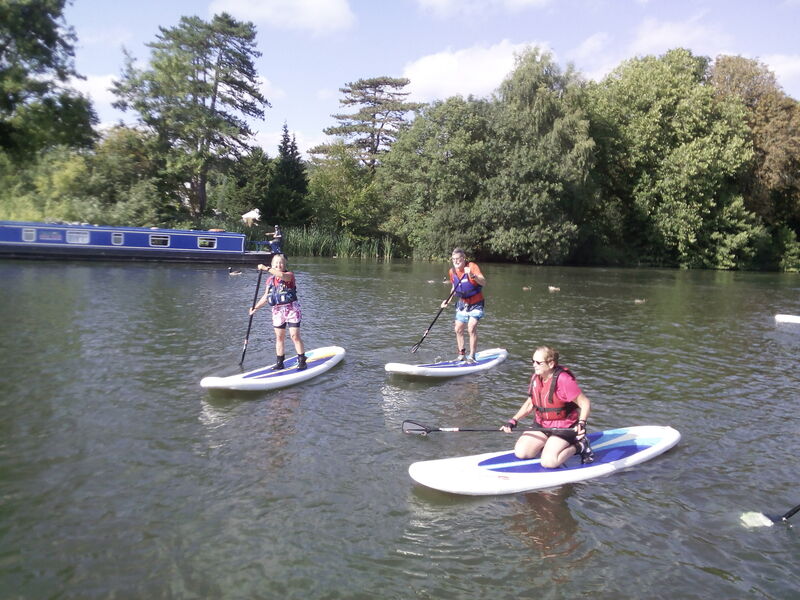 Over the weekend 21st-22nd July Pangbourne Canoe Club, the Adventure Dolphin Race group, competed in the British National Marathon Championships at Reading. Over 1000 boats from 55 clubs from all over the UK and some visiting international paddlers competed. Scorching temperatures made the event even more challenging but if you got too hot, you could always take a swim! The team of 9 K2s (double kayaks), 7 K1s, 1 C2 (double canoe) and 1 C1, did us proud. Vicky achieved a podium position; Gold for the O59 _ VLK1, this was an outstanding result – Vicky is the top in the country for her group! Tommy achieved a much deserved promotion to division 4 in U18_JMK1, competing against a field of paddlers ranked largely in divisions 1-3. Juniors, Amy and Jensen, completed their 3.5km Lightning (junior K1) race in under 30 minutes. This was Amy’s first race and she did well despite a problem with her rudder. Jensen teamed up with a Reading paddler to race in K2 as well. Rhys made his debut in K2 covering 3.5km in just over 30 minutes. Owen showed great fortitude by racing in K1 on Saturday and two K2 races on Sunday. The biggest race of the weekend was the mixed K2 with 81 boats on the start line. The wash was not quite a tsunami but nevertheless quite substantial for anyone in a wobbly boat. Peter teamed up with a paddler from Kirkcaldy for this event. Caroline teamed up with Shirley taking 4th place in O44_VLK2 – a fantastic result. Paul, Steve, Jarvis, Matt, Owen, Hazel and Vicky also raced in K2 on the Sunday. A great weekend for both competitors and spectators. Many thanks to Reading Canoe Club and their many willing volunteers for hosting the event. It was brilliantly organised. It was a bank holiday weekend….and we’re at a loose end…., so a small but select team from Pangbourne Canoe Club/Adventure Dolphin chose to race four, eight or twelve miles in a K1, K2 or C2 in the final Hasler Series race of 2018 at the Longridge Hasler on Saturday 25th July. The crowning glory must go to Peter W and James B who won division nine doubles. Peter and James are more accustomed to a double-edged sword (kayak paddle with two blades) but swapped their usual weapon for a single blade (canoe paddle with one blade) and won the division nine doubles race in a canoe rather than a kayak. 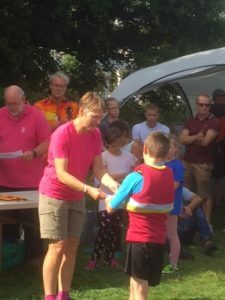 Their prize was a Longridge Canoe Club mug – a trophy to be cherished and certainly not put in the dishwasher or the writing rapidly vanishes. They were also promoted to division eight. The challenge now is to win division eight. Paul A and Steve M raced in division six doubles, coming second so gaining a much sought-after Longridge Mug. Paul was promoted from division seven to division five, so quite an achievement. Chris R delivered a steady performance in a strong division nine singles field where the first nine paddlers were promoted to division eight or higher. The winner was actually promoted to division six. Fay B and Caroline W did a good time in division five doubles despite the times being fast and Fay having to paddle up a division.